2015 Edition is Still Available. Click here to buy the 2015 edition. 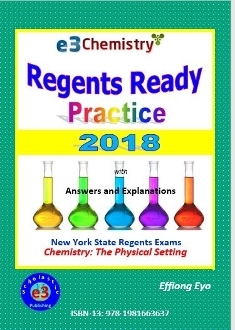 Preparing for Chemistry Regents Exam has never been easier, more enticing, more exciting, more engaging, more understandable, and less overwhelming. Our book is written to help students do more, know more, and build confidence for a higher mark on their Regents exam. With a total of five practice tests with answers and explanations, this book can be used as a primary question practice resource or as a supplementary resource to other prep books. Organized, engaging, doable, quick-practice quality question sets. Clear, brief, simple, and easy-to-understand correct answer explanations. With scoring guides to all constructed response questions. Keep track of progress, improvement, and readiness for your Regents exam. Start your Chemistry Regents Ready Practice today! Good Luck!